Facebook’s release of updated iOS and Android apps on the same day this week only highlighted the social network’s focus on mobile as the key to its future growth. Facebook CEO Mark Zuckerberg in October said he expects the company to eventually make more in mobile on a time-spent basis than desktop. A key part of keeping people sticking around in mobile is providing user-friendly apps for the two largest smartphone platforms. Facebook took a welcome step in August when it released a new version of its iOS app “rebuilt from the ground up” with Apple’s native iOS developer tools rather than the HTML5 programming language. The company followed the same playbook with the updated Android app launched Thursday, ditching HTML5 in favor of native code to improve speed and performance. “Now you can comment and like a story more quickly, and photo loading is optimized to be much faster,” noted Facebook engineer Frank Qixing Du in a blog post. Given the central role of photos in the overall Facebook experience, streamlining is especially important. Du pointed out that the company has moved a fixed-date release cycle for Android, suggesting new releases will come out more often. The latest Facebook app for iOS comes just a month after the last update. So far, the new version in the App Store has gotten a rating of just 2.5 out of five stars compared to the overall 4-star rating for the Facebook app. Initial reviews posted suggest the app still has some bugs to work out, with complaints about it crashing upon install or at later points. 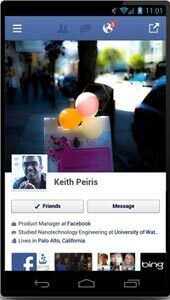 Facebook is also trying to bolster its mobile presence by providing increased support for app developers. The company this week gave developers the ability to link the Facebook page for an app with its corresponding page in the social network’s App Center. Also, Facebook created a new page instructing developers on how to promote their apps on the social network through app install ads and other tools.